Portland, Ore. — November 8, 2016 —The not-for-profit education services organization NWEA has announced a partnership with Esol Education, an international school management organization, to provide training to educators using NWEA’s MAP growth assessment in the Middle East. 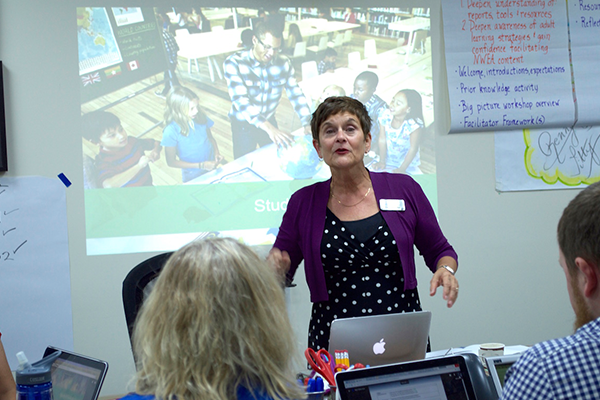 Through the partnership, NWEA-certified trainers will deliver professional learning workshops that support teachers in using MAP assessment data to target instruction and drive student growth. Esol Education will launch training workshops led by several of the organization’s top educators, who are also Certified MAP Facilitators, at schools across the region, with a specific emphasis on Esol schools in Dubai and Abu Dhabi. The workshops, which will support teachers’ effective use of the MAP growth assessment and its resulting data to inform instruction, will begin this month to coincide with the MAP testing schedule. The partnership marks the first time that NWEA and Esol Education have collaborated on a joint training venture in order to better serve the region’s schools. A longtime leader in providing high-quality international education in the Middle East, Esol Education was founded 40 years ago by Mr. Abushakra and currently serves more than 10,000 students in 10 schools across the United Arab Emirates, Egypt, Lebanon, and Hong Kong S.A.R. In addition to Esol Education schools, NWEA has partnered with more than 300 schools in the Middle East that use the MAP growth assessment. Northwest Evaluation Association™ (NWEA™) is a global not-for-profit educational services organization with nearly 40 years of expertise in providing innovative assessment solutions, including our flagship interim growth assessment, Measures of Academic Progress® (MAP®); our progress monitoring and skills mastery tool, Skills Navigator®; and the OECD Test for Schools (based on PISA). More than 8,500 schools, school districts, and education agencies in the US and abroad trust us to offer pre-K – 12 assessments that accurately measure student growth and inform instruction; professional development that fosters educators’ ability to accelerate student learning; and research that supports assessment validity and data interpretation. Educators currently use NWEA assessments with over nine million students worldwide. Visit NWEA.org to find out how NWEA can partner with you to help all kids learn.